The smallest dry stone structure – be it wall or edifice – represents tons and tons of stone which did not arise out of the blue. It may have been extracted locally, during field building operations, either by striking superficial rock strata with pick and crowbar or by splitting rocks with wedges and a two-handed hammer, or even by blowing up rocks with gunpowder charges. Alternatively, the stone may have been brought up to the surface of the existing field during ploughing, a process in which blocks and slabs are lifted off the underlying rocky substratum. Collective memory does not say much about the various tools used by dry stone builders, be they "makers of fields" or "makers of huts". One thing is certain, the "field makers" who were at work in the Coiron mountains in the Ardèche between 1850 and 1870 had crowbars, picks and wheelbarrows at their disposal (1). Likewise, the peïrié of the higher Vicdessos in the Ariège used such tools as a spade, a crowbar, a lever, a two-handed hammer and a hoist, for building the shepherd’s shelter and the various edifices making up the orri (2). A number of testimonies originating from Spain allow the blanks in the overall picture to be filled in. In the arid portion of the Montsià area in Southern Catalonia, the margenador (i.e. 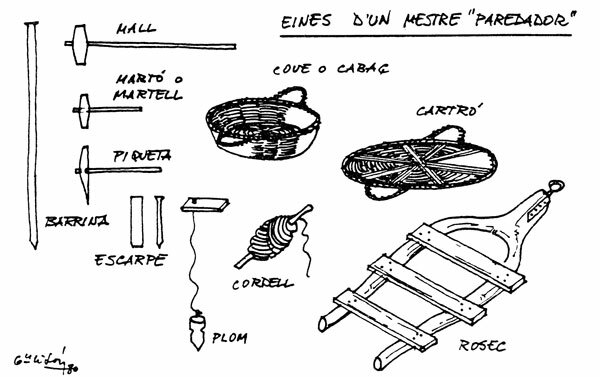 builder of terrace-supporting walls), still practising his craft in the first half of the twentieth century, would use a hammer (martell de margenar) and a marking line besides tools that are peculiar to peasants, namely pick, wedges, sled (tiràs), as we are apprised by Jaume Rossell and Miguel Subirats in their study of the olive groves of Southern Catalonia (3). - a marking line (cordell), for making straight courses, and a plumb line (plom), for giving the wall the same batter throughout. (1) See Jacques Avias, Les "faiseurs de champs" du Coiron (aux XIIIe et XIXe siècles), in Revue de la Société des enfants et amis de Villeneuve-de-Berg, 56e année, n. s., 1996, No 52, pp. 37-41. (2) See Jean Besset, Patrice Castel, Olivier Sanchez, Les orris du Haut-Vicdessos, in L'architecture vernaculaire en pierre sèche du Midi de la France : unité, diversité, prospective, Actes du colloque d'Auzat et Suc-et-Sentenac (12-13 juin 1999), Fédération méridionale de la pierre sèche, 2000, pp. 3-15, especially p. 7. (3) Jaume Rossell, Miquel Subirats, L'architettura dell'oliveto nella Catalogna meridionale, in Attualità del primitivo e del tradizionale in architettura, a cura di Giancarlo Cataldi, Atti del Convegno internazionale "Le ragioni dell'abitare", Prato, 8-9 gennaio 1988, Commune di Prato, Università degli studi di Firenze, Quaderni di studio sulle tipologie e sulla architettura delle origini, pp. 115-128, especially p. 125. (4) Miguel Garcia Lison et Artur Zaragoza Catalan, L'architecture rurale en pierre sèche du pays valencien (1re partie : 1/ les champs bâtis; 2/ l'obsession de l'eau), in L'architecture vernaculaire, t. 13, 1989, pp. 57-80, especially pp. 65-66.